With over 1000 accessions, the glasshouses are home to many exotic and unusual plants that are not found in many places in the U.K. 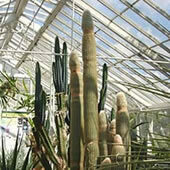 This house has the most varied collection of diverse plants in a small space compared to other parts of the Gardens. The hot humid atmosphere most nearly simulates the conditions of the lowland equatorial regions of the tropics and the species grown represent the great variety of life forms which are characteristic of these habitats; trees, climbers, epiphytes -plants that grow on other plants for support, ferns, shade-loving herbs and water plants. It has a minimum winter night temperature of 16°C. The Subtropical (Palm) House is the largest of our glasshouses, rising to 8m at the peak – a height sufficient to accommodate size-able trees including palms, tree ferns and a giant bird-of-paradise plant. In fact one tree fern Dicksonia x lathamii is unique to the gardens and the only one in the world! This house is kept at lower temperatures and humidity than the Tropical House. With a minimum winter night temperature of 13°C, it more nearly represents climates of subtropical regions. This house preserves something of the atmosphere of a Victorian conservatory or orangery. This early type of glasshouse was a popular feature of the houses of prosperous families in the last century. The central beds are planted with a wide range of citrus varieties. 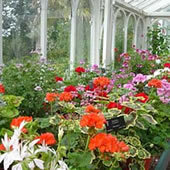 The left hand display shows a collection of Pelargonium (indoor geranium), ranging from the colourful hybrids used as summer bedding plants through to the wild species from which they all originated from South Africa and Australia. On the right hand side, a 70ft (21 metre) long display of unusual and colourful plants create a magnificent display every day of the year. 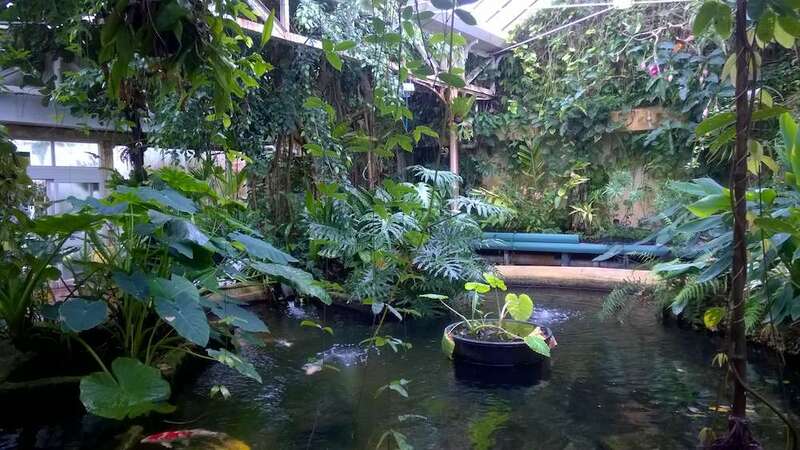 This glasshouse has a minimum winter night temperature of 10°C, similar to the Mediterranean. A glasshouse for plants from climates with low, irregular rainfall but also for plants of dry locations such as cliffs, deserts or tree branches. This house is allowed to follow ambient temperatures except for low-level heating in times of frost. Water is given about three times weekly in summer, reducing to zero between October and March. Plants range from tall cacti and succulents from Central America to drought tolerant shrubs like mimosa and bottle brush from Australia and living stones from South Africa. This glasshouse has a minimum winter night temperature of 7°C. 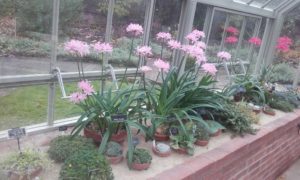 The Alpine House has an ever-changing range of Alpine plant genera from around the world’s mountain ranges. It also allows us to display our award-winning National Cyclamen collection.Alpine plants grow above the `treeline` on a mountain or hillside. There comes a point where conditions are not favourable for trees to grow due to exposure or altitude. Alpine plants have adapted to thrive in these conditions by growing as tightknit cushions which hug the rocks or by growing in sheltered crevices. In the wild, many Alpine plants are provided with a blanket of snow that protects them while in their winter `slumber`. 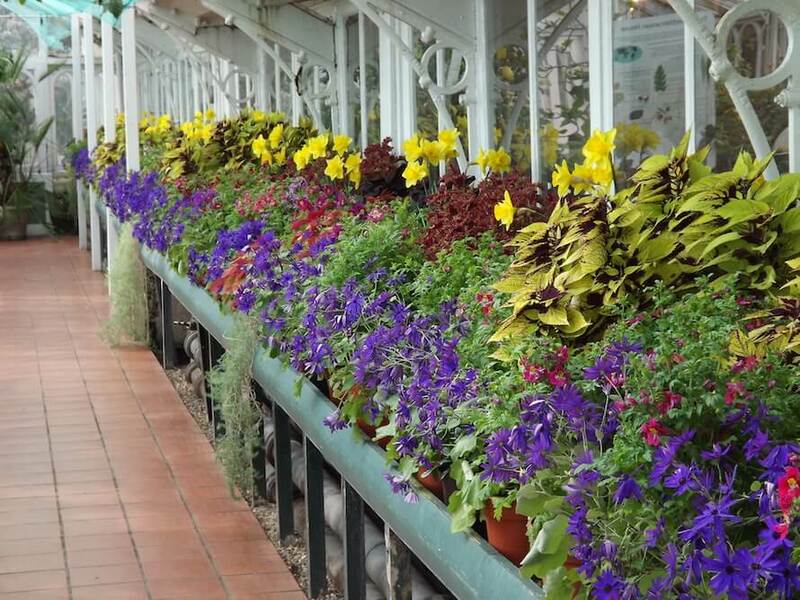 This is recreated in the Alpine House by keeping it cool and well ventilated. The Butterfly House is home to colourful tropical butterflies from the Philippines, Central America and tropical parts of Africa. 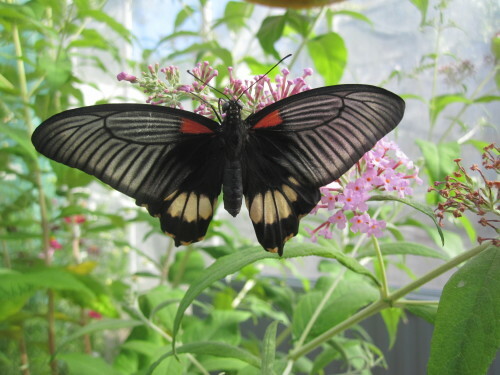 Watch these butterflies drinking from exotic, scented, nectar rich plants such as Lantana, Trachelospermum and Heliotrope. See them feeding on sugar-water feeders and saucers of fermenting fruit such as banana, apple and oranges. Each week 100 new pupae are placed in the emerging case- we attach them to bamboo canes with glue! Some of the pupae may hatch on the same day, whilst others take a week or so- if you are lucky you may see one hatch! On sunny days, the butterflies will fly around you and may even land on you to say hello. On cloudy days they prefer to rest in the foliage and are camouflaged as ‘dead leaves’. How many will you spot today? 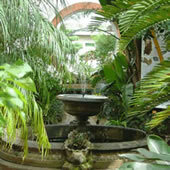 The Butterfly House is located at the far left corner of the gardens and is open everyday from late May to early September. From late September to early May, we change this glasshouse to an overwintering glasshouse. This is where, during the winter, we keep our cacti which were planted outside on the Terrace for the summer.